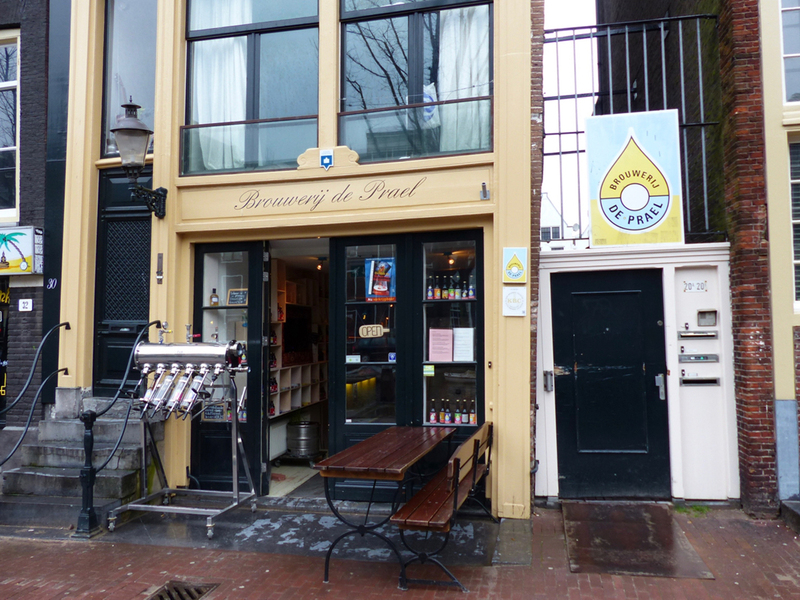 Hidden in a little alley in the infamous Red Light District is Brouwerij De Prael. A local Amsterdam beer brewery that uses 100% organic malt and hops for their beers. Delicious beers, I may add. What I also like about De Prael is that they work with people who have a ‘distance to the regular labour market’. At De Prael they give them a chance to participate and feel valuable again, whether this is for seven hours a day or seven minutes. As they say themselves: Brouwerij De Prael is all about people and beer! 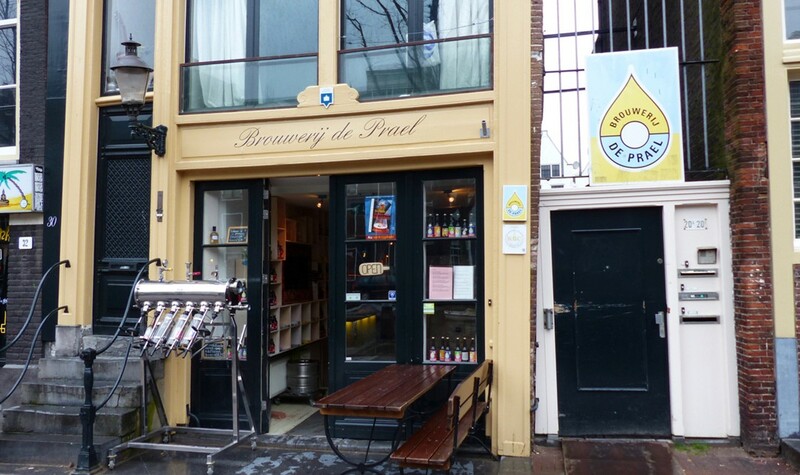 In the building where Brouwerij De Prael is situated you will find a shop, a tasting room/bar and the brewery itself. The brewery and shop are actually located on the Oudezijds Voorburgwal, just around the corner from the tasting room (in the alley). I’ve never done a tour through the brewery (yet), but the tasting room is a great, spacious place where you can taste al their own made beers. My favourite spot is the seating area with vintage arm chairs, couch and coffee tables, just above the bar. It is a homely, tranquil corner in the otherwise lively bar. It is also a great spot for people watching, a good thing as the patrons are very divers. This Amsterdam microbrewery has about ten regular beers and a few seasonal and special beers. I am hesitant to name a favourite, as taste is very subjective. The only way to find out your favourite is to try them all. What a hardship. But you can take your time as De Prael also has a good menu. Their snacks, lunch dishes, fresh starters and simple, hearty mains, of course go very well with beer. The times I have been at the tasting room, I’ve only tried some snacks. So there is no other alternative: I HAVE to go back to De Prael sometime soon so I am able to give you a full review of the bar/restaurant. Of course you drink beer because of the taste, but to me the story and philosophy of De Prael absolutely adds to the taste of their beers. Thirteen years ago they started as a small home brewery in the kitchen of a psychiatric institution. Nowadays they reside in one of the oldest parts of Amsterdam, where already in the 14th century beer was brewed. They still work with people with a psychiatric background that do not get a fair second chance in our society. It was nice to see the bar staff showing respect for each other and when things didn’t go so smoothly, that they were also patient. My Barleywine sure tasted a lot better after experiencing this. Knowing their philosophy and business set up, we can say that Brouwerij De Prael is a very socially conscious company. As to their environmentally consciousness we only have information on their use of 100% organic malt and hops. We have no information (yet) how sustainably they run their business. As far as we know they don’t specifically use organic meat or vegetables; but maybe we are wrong. We get back to you on that.